The National Industrial Security Program Operating Manual (NISPOM) establishes the standard procedures and requirements for all government contractors, with regards to classified information. It covers the entire field of government-industrial security related matters. 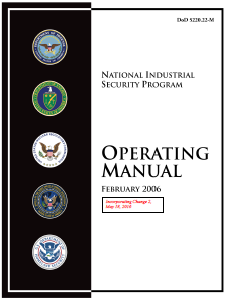 The NISPOM comes in the form of DoD 5220.22-M “National Industry Security Program Operating Manual (NISPOM)”. The website below links to the most updated copy of the NISPOM. Contractors must sign the DoD Security Agreement (DD Form 441) and agree to comply with the provisions of the NISPOM. Defense Security Service (DSS) oversees contractor compliance with the NISPOM on behalf of the Department of Defense (DoD) and 23 other Federal agencies.